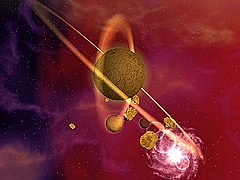 The Galaxy Journey 3D animated screensaver takes you on a journey through the galaxies as you blast off in to space. In a new 3D Galaxy Journey screensaver you can see great galaxies, huge rotating worm holes, worm hole tunnel traveling, asteroid fields, space stations, planets and beautiful nebulas all by advanced 3D-accelerated rendering. The registered version contains original music (by our own composer) and ability to setup your own music! Qweas is providing links to Galaxy Journey 3D Screensaver 1.1 as a courtesy, and makes no representations regarding Galaxy Journey 3D Screensaver or any other applications or any information related thereto. Any questions, complaints or claims regarding this application Galaxy Journey 3D Screensaver 1.1 must be directed to the appropriate software vendor. You may click the publisher link of Galaxy Journey 3D Screensaver on the top of this page to get more details about the vendor.